My voicemail recieved a pre-recorded message from the people that empty my bins: (US = ‘waste disposal service’). The impending ‘weather event’ might interrupt my service. Not to worry! They’ll come next week and take twice the rubbish away. Hooray! Wonderfully polite and thoughtful. ‘weather event’?! Seattle services’ way of saying “snow“, “high winds“, ‘something not nice’, ‘some nastiness’ without causing customers to panic. Or, maybe they’re expecting a heat-wave and the bin service people to call in ‘sick’ as they dash to ‘reccuperate’ on the local beaches with their surf boards. ‘Weather event‘ certainly covers a broad range of possibilities. Near me the weather event turned out to be a couple of hours of snow, producing ‘slush’ on the roads, local Seattle drivers aqua-planning or deserting their cars on the roadside. Some parts of the Seattle region collected over half a foot of snow. Meanwhile, LooSea didn’t even skid in our local 3 inches. 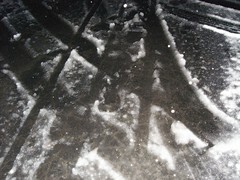 Here are LooSea’s tracks mixed with evidence of people, cars and bicyles outside the Wendy House… …in the evening slush.. This scribble was published on Friday, January 12th, 2007. You can follow any banter on this scribble with the RSS 2.0 feed. You can share your inspired musings after typing the anti spam word near the bottom of the page. But no Pinging because its too naughty.